Responses @HenryChesbrough on service platforms, living labs, and the future of open innovation. Since 2003, he has provided a precise definition, as the godfather of open innovation. 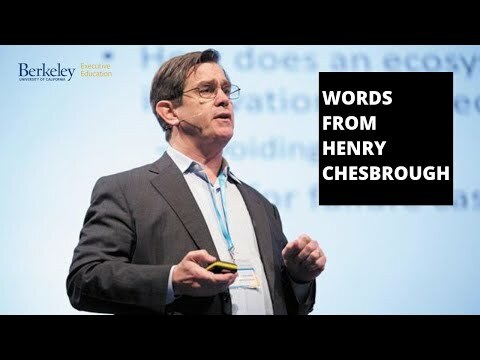 InFocus Podcast with Dr. Henry Chesbrough. Dr. Chesbrough is the Program Director for the UC Berkeley Executive Education program, Corporate Business Model Innovation. [12:34] >>Interviewer: When you talk about service platforms and you need a good service platform to succeed, is that what you’re talking about, or can you explain to us what a successful platform is? >>Dr. Chesbrough: The service platform resolves a fundamental tension in this idea of adding services to be more intimate with your customers to escape the commodity trap. Basically to make things affordable, you want to standardize them so you can share and reuse as much as possible. The problem is we don’t all want the same thing. The best way to give us what we want is to have everything be fully customized, get exactly what you want, which may be different than what I want. The tension between standardization and customization is where the service platform comes in. You embed in the platform the things that can be shared and reuse widely, and then you extend off of the platform to deliver the customized things that individuals want. A quick example of this would be all the apps on our smart phones. The smart phones themselves and the app store that deliver them are the platforms, but none of us have the exact same suite of applications on our smart phones nor do we have to. We get the things that we want but we get them in a way that makes it very affordable for us as well. So that’s the idea of a service platform. [13:54] >>Interviewer: I’d love it if you could explain, too … I know you’ve been quoted talking about living labs. Obviously it must apply to open innovation. Can you give us a little background on what that is? >Dr. Chesbrough: Living labs is something that’s really emerged out of Europe. I had the great pleasure of spending nine months last year in Barcelona, which if you have to leave Berkeley, Barcelona’s a great place to spend some time. One of the challenges in Europe, they’re very envious of us here in the US especially in Silicon Valley for the magic we have of turning all these great ideas and research into new ventures, new products, new businesses. In Europe they complain about what they call a innovation gap. They’ve got great science and great technology, but they don’t have the same vibrant startup environment, the same new culture toward entrepreneurship that we have in the US. So living labs is a response to try to close the innovation gap. When these research and technology projects are concluded in the university setting, can we find a place to put them to nurture them further and bring them to life? So it’s not a traditional academic research lab. It’s a much more practical place to work more on these technologies to really get them ready for use in industry. One area where we’re seeing these living labs is in smart cities where municipalities like Barcelona or Amsterdam or London or Paris are trying to put technology to work to really reshape the urban environment in which these people live in ways that make citizens’ lives better, bring new sources of revenue to the city, and often save money or improve safety of these kinds of things using technology and experimenting through these labs. [24:56]>>Interviewer: How about the future for open innovation? If you had a crystal ball, if you were looking down the road 10, 15, 20 years from now, where do you see it going? Dr. Chesbrough: Let me give you a short-term and a long-term answer. In the short-term, open innovation is moving from collaborating between individual firms or organizations to collaboration throughout an entire ecosystem of companies, developers, third parties, users, suppliers, a very rich, multifaceted thing. This is actually been labeled open innovation 2.0 by the European Commission which has really gotten behind this as part as their policy going forward. In the short-term, it’s easy to say because it’s already starting to happen. This is where open innovation is going. In the longer-term, I think open innovation might follow a path like that of the quality revolution. In the 1980s, the US companies woke up to the gap with Japan and how much more reliable many Japanese products were relative to US products, and so US companies really embraced quality as a strategic imperative. They had quality departments, quality organizations, and they embedded in the companies a real need to do this well from the very beginning of the design, not just inspecting at the end of the process. Today, most of those quality organizations are gone. The thinking is there, but it’s now embedded in how the company does business so you no longer need the quality department overseeing all this. That’s a possible long-term future for open innovation. Openness is not going to go away, but it may become part of the fabric of the company. Instead of today having open innovation departments and people with titles of manager of open innovation, director of open innovation, and my personal favorite, vice president of open innovation, in 30 years those titles may be gone, those organizations may be gone, and this may just be part of how companies do business.